With respect to SSS ID capture machines, there is one for you sure you can find at the SSS main office which you can find at SSS Building East Avenue, Diliman Quezon City. For telephone numbers before you apply, please call (632) 920-6401, 920-6446 while you can also try to email them at – member_relations@sss.gov.ph. Makati also had their own ID capture machine as well as Manila branch. SSS ID form E-6 may be downloaded at the SSS downloadable forms section on their website. On the other hand, there is an extra charge for lost ID, damaged ID or for removal of the date of birth as per owner request. The usual mailing of the SSS ID is withing 30 days. IF you don’t receive it withing that period, please contact or inquire at your nearest SSS branch. can i have my sss id processed in tacloban city, leyte? is the machine for sss id available there? i just want to know where can i get an application form to be able to get an sss id? may i also know the requirements for me to be able to apply and what branch is easier for me to apply? Please tell me what branch can I apply for the ID Card. dami ko na branch napuntahan lahat wala. Kahit dito sa area namin wala din. My branch nga wala nman ID capture. Please SSS sana make it available in all of your branches. Please make it easier for us to apply. i tranfer my last name,,because im marrage what i do,,and what is a requirment i submet? thank you. Regarding my SSS ID. Haven’t recieved it yet. Applied last Sept. 18,2009,F. Blumentritt, San Juan Branch, ss # 0394434557. Thanks! i want to know coz lost my sss no slip..i hope you can help me guyz..i really need it now..
Pano kung ung company ay hnd ngpprocess ng sss contributions. I mean d sila ngkakaltas s sweldo namin. Ano pong actions dapat gawin. Maraming English On-line Teaching companies ang hindi ngcocomply s Philippine laws. Hindi rin sila ngi-issue ng employment id kaya di nmin masabi n employed kami sa mga transactions na ginagawa namin. Pwede ba mg voluntary member na lang? Thanks. hi! my question is why do i need to go back after 15 working days after i submitted my form and requirement for the SSS I.D. card? Di ba dapat upon submission process na agad un form, take picture and so on and so forth then wait ko nlng un card for mail? i acnt understand why do i need to come back? taga lucena quezon po ako,ask ko lng po were can i get sss id.thanks. sna maayus n ang machine ng sss id d2 s fti pra nman mkpagpa id rn kainis dme nlang kinikita ndi mapaayos yung machine ng id layulayu q p pra pumunta sa kalookan tas 6am plang cut off n its not unfair sna all branches ng sss pwdng mgpa id pra ndi kme kung saan saan nagpupunta……………. the machine for i.d cards here in iloilo has been broken and still hasn’t been fixed yet. when can we have our i.d then? it has been broken for more than 2 years now..
i’ve been paying my contribution since august under a new company but until now it’s not posted.. how can i apply for a salary loan then? when do the sss post our remittances online?? we badly needed our loans approved as soon as possible..
Hello to SSS!! i want you to know that i am disappointed about your filling SSS id..i filled my new id last april 30, 2008. then until now i didnt got my SSS id. wow! It’s 2010 now? what hanppen to my SSS id? i don’t know what’s going on there? they didn’t tell me..i’m tired of waiting here..please help me to find a way to get my id..i’m good member i pay my contribution always in advance and now they didnt treat me nice..how come..
pede b akong kumuha ng sss id card kahit nandito ako sa ibang bansa?? hi,im working here now in canada jst 2mos.im an sss member bfore 1995-96.i pay as a self employed member now im planning to have a salary loan,then i continue paying,..is it possible?thank u and more power!Godbless! Yes it is… you’ll just have to pay the same way you did before but you’ll have to ask the SSS about matters on how much because you are now considered an OFW member… Such cases change when you change status from self-paying to another category which is working member abroad. can you help me to apply for my sss id? im here in dagupan city, i went to the nearest branch but they do not have the machine for id capture… sa manila daw mag aapply… please po can you help me? Initial ID ko pa lang po ito and i am willing to pay, because all i need is just to get my sss id. how much? thanks! i just want to express my frustration with sss…. na-id capture na ko nung january 2008 and nafollow up ko na sa sss and to whomever possible ang tungkol dito but very unfortunately until now 2010 na di pa rin dumarating ang id ko. sabi sa hotline nyo pag nasend na daw ninyo at may job order number na wala na kayong alam pagkatapos. anong klaseng serbisyo ba ang ibinibigay nyo sa aming mga Pilipino? napaka-on time magbayad ng conributions ng company namin pero eto kayo, you’re making us all stupid waiting for this very precious id. and now that i im planning to apply for another baka naman po pagbayarin nyo pa ulit ako na parang ako pa ang may kasalanan. Ive lost my SSS ID, and I’m on the process of a status change as well from single to married. What do I need to do so my married name will appear on my SSS ID? How long will it take? You will have to file for a SSS change of status. Usually, if you work, you will have to get the SSS change status form from your office so that they also know about the changes on your SSS membership account as this will affect their contribution to your Social Security System remittance. In case you do not know, the system is that if you remit Php 100.00, your company will also remit their part which is of the same amount. Hi, saan po ba puede magpa ID? sobrang haba kasi ng pila sa Main Office.. 4am pa lang dapat nakapila na daw? Hindi naman po ganoon. Actually by experience po ay mas madali ang tanghali magpagawa ng SSS ID kasi mabilis naman ang pila doon sa loob sa dami ng counters. Try nyo po para po alam din nyo… Iba iba naman po ang experience ng mga nagpapa SSS ID capture doon e.
i want to apply for an sss id. but until now the id capture machine in makati is still busted. its been busted for more than a year now. how many years does it take for them to fix the machine? if i wer u ms gesselee u better go to caloocan or ss main in able for u to apply for an id..sugestion lng nman..
hi, matagal na rin po yatang down ang id capture machine sa calamba office ninyo. palagi ganun nalang ang sagot ng mga employees nyo. now, interested po ako sa bagong sss-postal id pero pano po magkakaroon nun? is it different from the one you’re currently issuing? 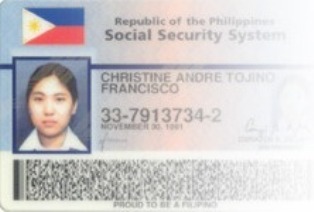 i got my id last 2005.after that i went abroad to get married and stayed there for 4 years.unfortunately i lost my id abroad.i just came four months back.is it possible to get new idcard even if i havent used my sss id for 4 years.iwant to know what procedurehow to get anew id card.what form to fill up.isit necessary for me to change my last name because i got married or do i have option to keep my maiden name on my new card.all my other id like passports ,imstill using my maiden name.is it possible.hope for your quickreply thanking you. why are your employees so impolite?? it just makes us be impolite as well and can’t help it but tell you that we pay our taxes and sss fees so we’re hoping to at least talk to an employee who doesnt nag at you when you ask something. that’s the reason we asked: we dont know. i know this wont do anything but please. we are the the customers here. thanks. how mch will i pay to have an sss id? I have been a member since 03/06. I tried to access my SSS account online and check my eligibility for a loan. The reply is that I am NOT qualified for a loan since my status is TEMPORARY. I have my SSS Number but does not have an ID yet. I applied for new sss id with my new married name. I completed the process last Sept 2009 @ SSS Legazpi City, Albay. they said that it will be mailed after 30 days but until now i havent received it. Can i pick it up instead, i’m here in Manila. Hi, would like to inquire when will the id capture machine be available to us sss contributors in Baguio City. Been waiting for it. I hope that they deliver when they are asked, the same way we deliver when we are asked to pay our contributions on time. Hanggang ngayon po sira parin daw ung machine para sa sss id dito sa Lucena City branch. ang tagal ko n pong gustong magpa-id kaya lang itinuturo pa kami sa main branch. hanggang kelan po kaya mgaayos yun, mahirap lang po ako at hindi po madali para sa akin ang pumunta pa main para sa id ko. Sana po masikaso agad. I would like to apply for my SSS ID (first time). I gave birth last year, so I also want to update my dependents. I got my forms ready, but can I submit all of them at the same time? Also, at which SSS branches can I submit the documents? I want to inquire online about my SSS but I lost my SSS ID. How can I get my SSS ID No without going to a local SSS Office? my ngbabasa b n tga SSS s site n 2..?? nkakarting b ung mga problema ng mga member s my concern s mga reklamo nmen..? ?sna lng..
wala pa rin po ung sss id ko.nag pa id na po ako nung una di na po dumating.sabi nyo ulitin ko na lang eto inulit ko po.di rin dumating.ang haba haba pa naman ng ipinila ko.tapos hanngang ngayon di ko pa rin narereceive.ANO BA NAMAN YAN? may bayad po ba ang pagkuha ng ID? Gusto ko lang bpo itanong na kahit nakitira ako sa Japan Makakakuha ba ako ng sssID.Nagbabayad ako ng sss pero wala pa sssId.Ano ang dapat kung gawin para magkakuha ako ng sssID. Ineed your concern.Thank you. I lost my SSS ID and Im from Olongapo. Unfortunately, they said they have no machine that makes the ID. My question is, can I apply for my ID replacement to other branch online? That I dont have to go there personally kasi malayo na po lugar namin. May I know also the details or other options to acquire an ID again. Thanks. Pwede ba akong makakuha ng sss ID kahit na nasa ibang bansa ako .Kung maari lang po na pakisagot. Para maayos ko kung ano ang mga kailangan.Maraming salamat po. i want to have an SSS ID and to be a member of SSS but the problem is i am here in netherland..
hello po.sa cebu po akonagpacapture ask ko lng if pwd ko ba makuha d2 sa mainla ung sss id card ko.and mga ilang months po bago un makukuha kc kailangan ko tlga e….and 1 more ask din po ako if nafixed na ung machine kc it was broken daw?sana lng pagbalik ko dun ok na….